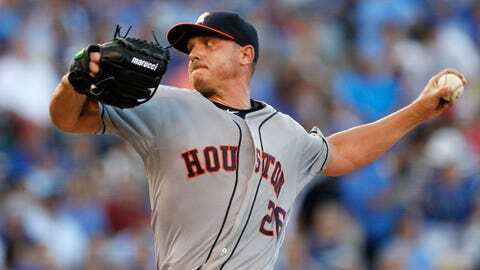 Scott Kazmir is in the position of being able to give the Astros a commanding 2-0 ALDS lead on Friday. The Houston Astros walked in to Kauffman Stadium on Thursday evening and took Game 1 of the ALDS from the favored Kansas City Royals thanks to the arm of Collin McHugh (6 innings, four hits, two earned runs) and shutdown relief work from Tony Sipp, Will Harris, Oliver Perez and Luke Gregerson. Offensively, they were the beneficiaries of home runs by Colby Rasmus and George Springer, as well as a 3-5 night from second baseman Jose Altuve. A.J. Hinch’s club more or less picked up where they left off in the Wild Card Game, and gave them the advantage in this best-of-five series. Game 2 is Friday afternoon, and for lefty Scott Kazmir it’s another chance to prove his worth to the club that picked him up in a mid-season deal with the Oakland Athletics. Kazmir met with the media on Thursday and he definitely understands the context of his Game 2 start against Johnny Cueto (the Royals’ big mid-season acquisition). As he told Jane Lee of MLB.com, "For them to have the confidence in me to pitch Game 2, a very important game, pivotal game, I think it shows a lot about what they think of me. I’m just going to go out there and try to do my best." After starting strong with the Astros in the summer, Kazmir struggled down the stretch. He had only two wins in 13 starts with Houston, and put up a 6.52 ERA in six starts since August 22 (the date of his last victory). However, Kazmir’s first start with the Astros was in Kansas City back on July 24, and he dazzled his new employers by tossing seven shutout innings and allowing the Royals just three hits. The Astros are hoping he’ll pitch like that again on Friday, and manager A.J. Hinch expressed no hesitation about handing him the ball. "Once you toe the rubber and you’ve got the environment we know it’s going to be tomorrow afternoon, the intensity of the game, all bets are off," Hinch told Lee. "But I like the comfort of knowing he’s pitched well in this park. He’s pitched well against this team. He’s been there, done that before. And that factored in. This team was built to create a little bit of havoc on lefties and righties. Scott has done it before, and we hope he returns to that tomorrow." 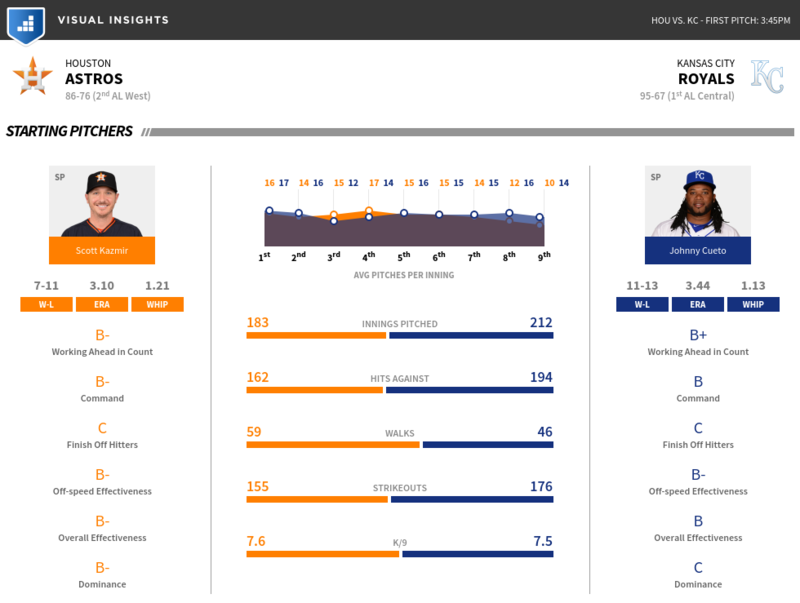 If Kazmir’s able to keep the Royals in check and the Astros disrupt Cueto’s game plan effectively, they could very well head back to Minute Maid Park with a commanding 2-0 lead on the reigning AL Champion Royals.